Thanks for this forum and its members, ( Cariboocoot, Chris Olson, to Dave Angelini and BB ) and all in between. Equipment I have: 2 Trace SW4024, I know they are NLA. Only using one. I have no 208/240 loads. 4-6 Canadian Solar CS6U330P, They fell in my lap. hopefully using #8 or #10 wire. Any help would be greatly appreciated. If the new genshed location has good sun, 125' would be much better. Generally, 3-5% is considered "acceptible". With a 24v bank and strings of 2 though, even with 7% drop you'd still have good headroom for mppt - just a matter of whether you're ok with a few extra % losses. Another alternative would be to use a Classic 200 and higher string voltage for the 250' location. If the shed is a 125 feet from your home/office... You might wish to look at higher voltage array (and possibly a charge controller) to keep the stuff you want to keep an eye on closer to where you live. 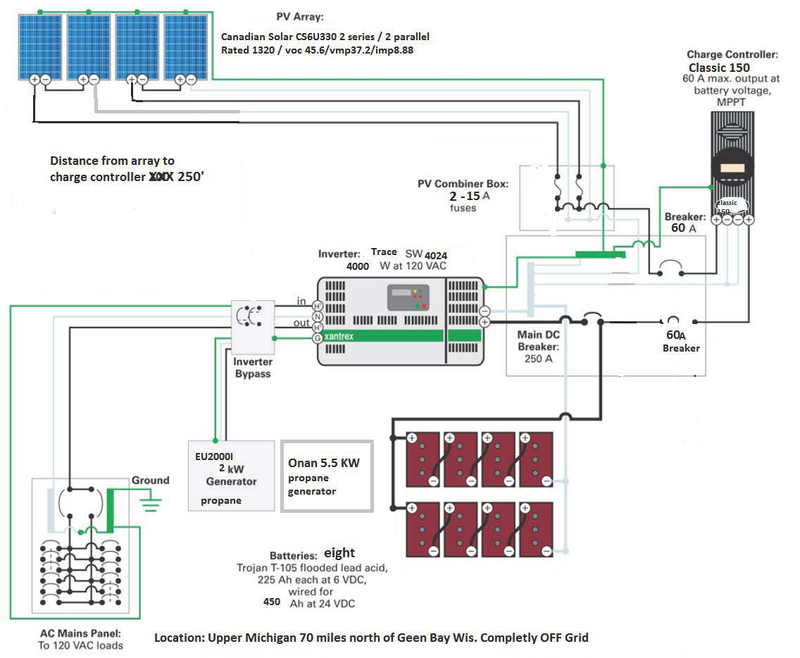 For some examples... 2p x 2s panels, 250 feet, 3% drop, Vmp~37.2 and Imp~8.88 amps. Assume cold climate and Vmp-array~100 VDC max... That means 3 panels in series with the Outback FM controller is not a good fit (check your low temperatures and maximum Voc-cold for your panels). You would need 5 AWG or heavier cable to get below 3% drop. Both Schneider and MorningStar (Outback now or soon?) have controller that will take Vpanel~600 volts, and Vmp-array-std~400 volts. 400 volts Vmp / 37.2 volts Vmp per panel = 10.8 panels = 10 panels in series (based on Vmp-array-std max rating for cold climates). It is easy to spend somebody else's money.